Look what we found for you on Amazon! Hurry and get the Monopoly Junior Game: Disney/Pixar Incredibles 2 Edition today for only $10.49 from Amazon! That’s 38% off the list price! This is a 1-day only deal so hurry! Check out all of the Amazon deals here! Amazon Prime members get FREE 2-day shipping!! If you are not a Prime member, get FREE shipping when you purchase $25 or more of eligible items across any product category. See the Monopoly Junior Game: Incredibles Edition details below! Includes gameboard, 4 character tokens, 24 Chance cards, 48 character markers, 90 M1 banknotes, die, and game guide. Ages 5 and up. For 2 to 4 players. Suit up with the Parr family, because it’s showtime! Kids can imagine embarking on a super-adventure and explore the locations inspired by the world of the Disney/Pixar Incredibles 2 with this edition of the Monopoly Junior game. The hero who earns the most Monopoly money saves the day. In this easy and fast-playing game, kids travel around the board as Mr. Incredible, Mrs. Incredible, Violet and Dash. Players explore the city, buy unowned properties, collect rent, and pick up Chance cards. The cards feature events from the movie and kids can have a blast imagining being part of the action. Copyright Disney/Pixar The Hasbro, Hasbro Gaming, Parker Brothers and Monopoly names and logos, the distinctive design of the gameboard, the four corner squares, the Mr. Monopoly name and character, as well as each of the distinctive elements of the board and playing pieces are trademarks of Hasbro for its property trading game and game equipment. 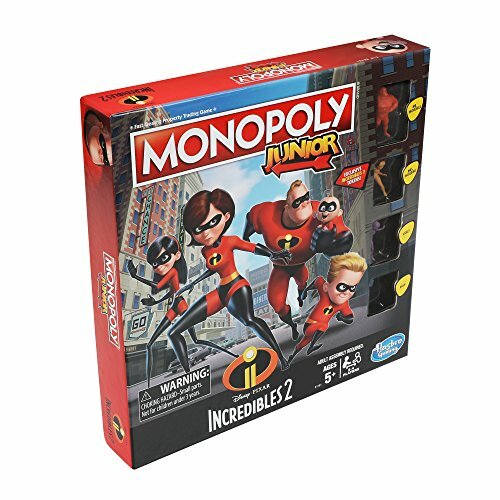 Buy the Monopoly Junior Game: Disney/Pixar Incredibles 2 Edition from Amazon.